Black metal wine rack in a grid format comes with brackets rackets for mounting to the wall. This wall wine rack measures 29 1/2"w x 66"h x 7 1/4"d and holds up to 144 bottles of wine. The size of the openings (pigeon-holes) are 3 3/8" high x 3 3/8" wide. Standard format Bordeaux bottles are easily accomodated within this wine rack. Some larger format 750mL Bottles such as larger Burgundies, Amarone's, Turlies may not fit. The wine racking consists of four panels that are 14 3/4" wide x 66" high each. They are installed side-by-side (two in front/two in rear) giving an overall width of 29 1/2". Many people have inquired if this rack can be turned on its side. Yes - a half portion can be positioned on it's side. This would give you a rack 66"w x 14 3/4"h with a capacity of 72 bottles. If turned on it's side, you can not achieve total width of 29 1/2" as the hardware does not allow for stacking. The modular design of this metal wine rack gives you great flexibility for the arrangement of your cellar. Modulars must be attached to the wall with simple metal mounting brackets (included) and can be connected side by side. This rack is also sold as the 152Grid, assuming storage of an additional 8 bottles on the top of the rack. As there are no top cleats to support bottles, we do not actively promote the additional bottle capacity, hence we have re-named it the 144Grid. All hardware is included for mounting on the wall. Shipping will decrease with multiple racks ordered. The racking box is about 25 lbs & considered oversized, hence the higher delivery cost. 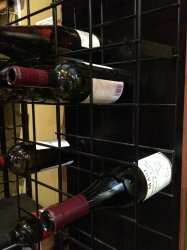 The Metal Grid 144 Wine Rack, is a Canadian made economical racking system produced by a metal fabricator located in Etobicoke, ON, Ontario, CAN. These economical black metal wine racks are available for sale throughout the United States of America (USA) and Canada.